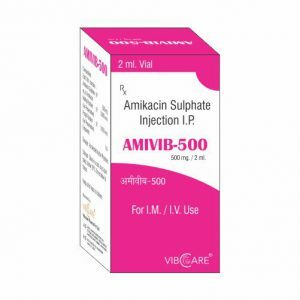 Amikacin is a semi-synthetic aminoglycoside antibiotic derived from kanamycin A. Similar to other aminoglycosides, amikacin disrupts bacterial protein synthesis by binding to the 30S ribosome of susceptible organisms. Binding interferes with mRNA binding and tRNA acceptor sites leading to the production of non-functional or toxic peptides. Other mechanisms not fully understood may confer the bactericidal effects of amikacin. Amikacin is also nephrotoxic and ototoxic. Mild and reversible nephrotoxicity may be observed in 5 – 25% of patients. Amikacin accumulates in proximal renal tubular cells. Tubular cell regeneration occurs despite continued drug exposure. Toxicity usually occurs several days following initiation of therapy. May cause irreversible ototoxicity. Otoxocity appears to be correlated to cumulative lifetime exposure. Drug accumulation in the endolymph and perilymph of the inner ear causes irreversible damage to hair cells of the cochlea or summit of ampullar cristae in the vestibular complex. High frequency hearing is lost first with progression leading to loss of low frequency hearing. Further toxicity may lead to retrograde degeneration of the 8th cranial (vestibulocochlear) nerve. Vestibular toxicity may cause vertigo, nausea, vomiting, dizziness and loss of balance. For short-term treatment of serious infections due to susceptible strains of Gram-negative bacteria, including Pseudomonas species, Escherichia coli, species of indole-positive and indole-negative Proteus, Providencia species, Klebsiella-Enterobacter-Serratia species, and Acinetobacter (Mima-Herellea) species. Amikacin may also be used to treat Mycobacterium avium and Mycobacterium tuberculosis infections.